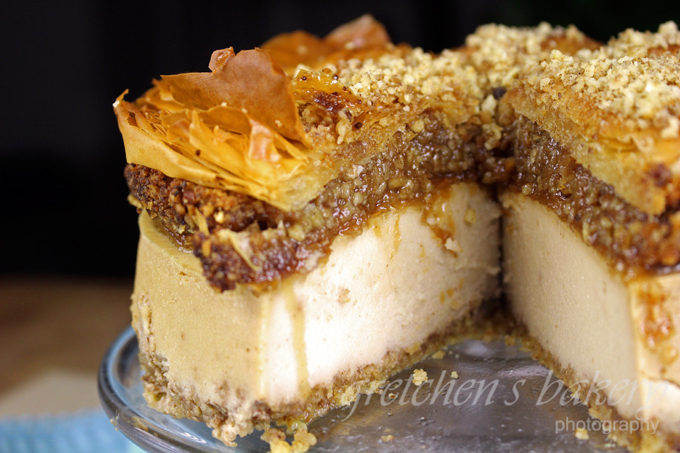 Vegan Maple Baklava Cheesecake, that’s what! 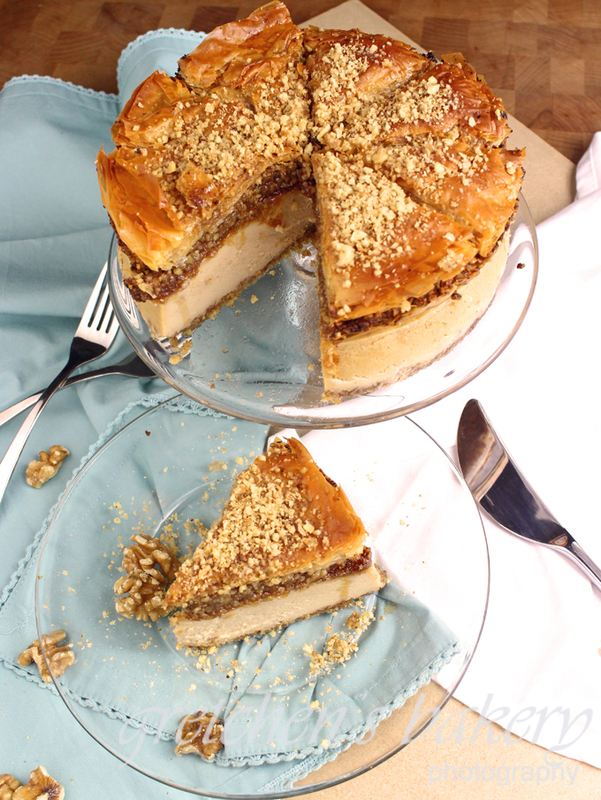 And it is now topped with rich, maple walnut baklava. If you have never made (or even had) baklava you are in for a treat. A truly decadent dessert; this middle eastern pastry is known for it’s richness. 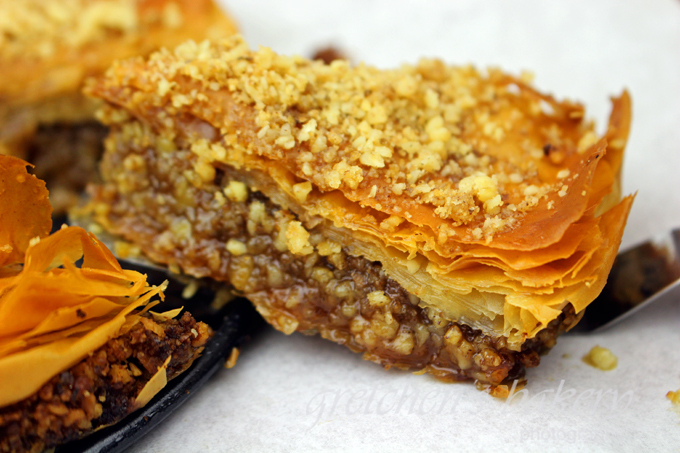 Flaky layers of Phllyo dough packed with nuts and the signature syrup drenching every morsel. Traditional Baklava is made with pistachios and walnuts, but I strayed from the norm slightly and stuck to only walnuts. I added maple syrup and maple sugar to my recipes courtesy of Maple Valley Cooperative for a really unique spin on a classic. Maple Valley Cooperative is in Wisconsin, but they will ship everything to you! They sell much more than just maple syrup and maple-y type products, however their maple syrup is top notch! And the maple Candy! Oh my goodness! Nothing can compare to using real maple syrup in recipes, since all the cheap-o brands are merely pancake syrup made from high fructose corn syrup. Definitely don’t skimp this time and use only the real deal here for this recipe. Be sure to check out their website and see if something sparks your fancy! They sent me some samples of their awesome products in return for this signature recipe. And well, here it is! 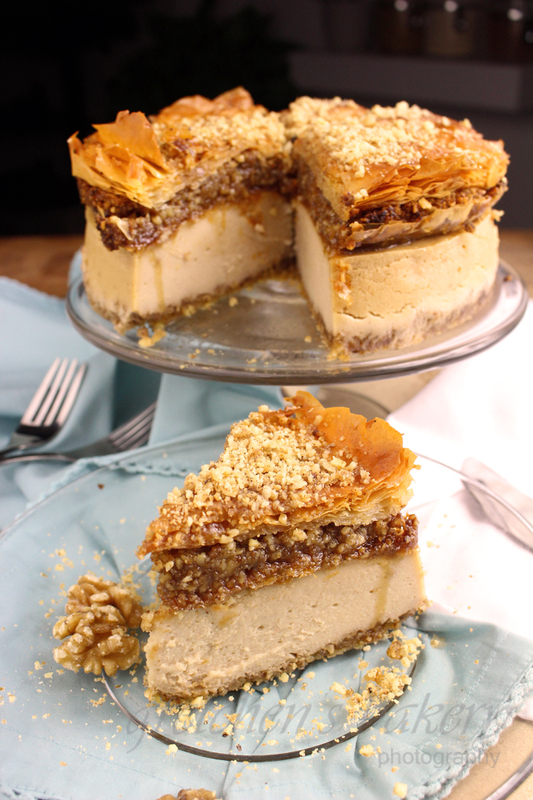 Introducing Vegan Maple Baklava Cheesecake! 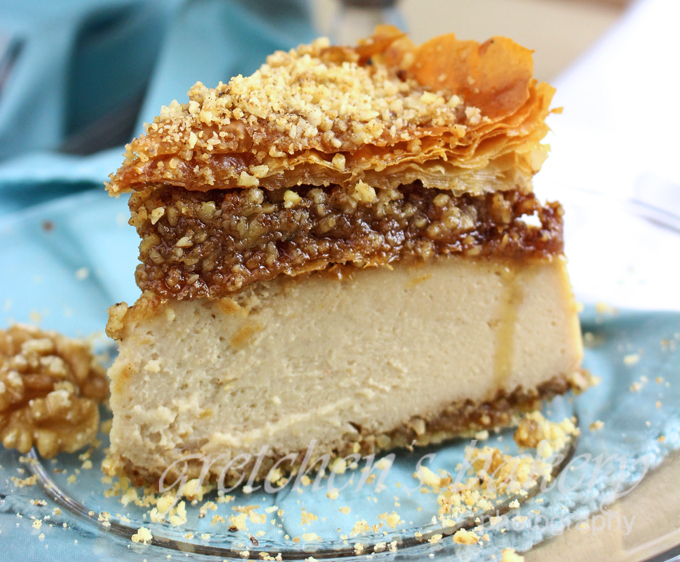 You will need a 7" Springform pan for this project to make the baklava the same size as the cheesecake. I like the small addition of tofu to my cheesecakes, I feel it makes the cake a tad bit lighter than all vegan cream cheese, but of course you can go that route if you prefer! I love a hint of orange in baklava, so I used my candied oranges that I made for my Fruit Cake Cookies and Orange Chocolate Tart. I don't expect you to make them JUST for this recipe, (I would not!! LOL) So use fresh orange slices and the zest for the recipes below instead! Grease and line a 7" cake pan with professional bakery pan grease and parchment paper. Lightly toast all the walnuts from all the recipes above together in one large sheet pan, then divide them up later. For less than 8 minutes at 350° will be fine, you do not want to over toast them, or they get very bitter. Prepare the crust by placing 1¼ cups of the cooled toasted walnuts in a food processor with the cinnamon and the maple sugar. Add the melted vegan butter and process to a fine grind, be sure not to make a paste, you are not making butter! Press the crust mixture into the bottom of the prepared pan and set aside in the refrigerator until needed. For the cheesecake combine all the ingredients together in a food processor and process smooth, scraping the sides and making sure that is is ultra smooth. Pour the batter into the prepared crust and bake in a water bath at 350°F for 1 hour. After 1 hour turn the oven off and let it cool inside the oven for another hour. Cool on the counter the rest of the way, then refrigerate for at least 4 hours before un-molding. 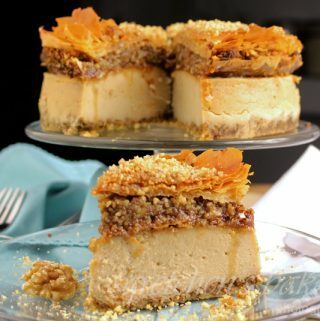 Meanwhile make the baklava by combining the other walnuts (1½ cups) with the cinnamon and candied orange (if using) and pulse to a fine grind. Be careful not to over process or you will have a nut butter! Save one half for another baking project and then cut the other half to fit your 7" diameter springform pan. Layer the phyllo in the bottom of the lightly greased 7" springform pan 2 sheets at a time and brush only the top of the 2nd sheet lightly with the melted vegan butter. Pour the walnut cinnamon mixture over top and then repeat the layering and buttering of the remaining sheets of Phyllo. Meanwhile cook the maple syrup with the water and orange to a boil and let boil for 1 minute. When the baklava is done baking, remove from the oven and immediately pour the maple syrup mixture (remove the oranges) over the hot baklava. Let it cool at room temperature until you are ready to top your cheesecake with it! Baklava can be made ahead of time and stored wrapped tightly at room temperature for up to 3 days or for 10 days in the refrigerator covered tightly to prevent drying out. 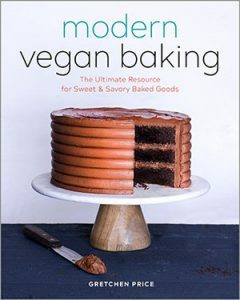 I do not like to freeze vegan cheesecakes, the texture changes pretty drastically in my opinion so I prefer not to freeze. 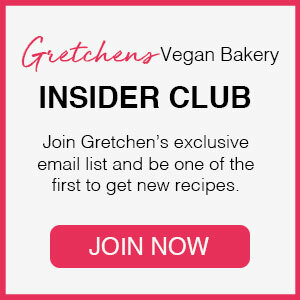 This is a little off the subject but can I use cornstarch instead of gelatin in a recipe? If so, do you know what the ratio is of cornstarch to gelatin? Thank you!